Gong is a liveness and safety checker for MiGo types. Below are instructions to try the tool-chain, which was developed for Fencing off Go: Liveness and Safety for Channel-based Programming and has passed the POPL 2017 Artifact Evaluation. The table below describes the examples we evaluated in the paper and (if applicable) their origins. Additionally, we give instructions to test your own examples. You can write your own Go programs and feed them into GoInfer then Gong (see limitations). Alternatively, you can write MiGo types directly and check them with Gong. The inference tool is an early prototype, and does not cover all syntax of the Go programming language. In particular, we have limited support for closures, and functions with no communication are best inlined. As part of the infrastructure, some extra tools are built to help with troubleshooting in the case of inference error. concsys Web crawler from github. fanin-alt Infinite fan-in pattern with range over channel from [NY2016]. Note Below pre-compiled binaries are for for Linux x86-64 only. First, download and unpack tools.zip. The md5sum of the zip archive is 1a0c8f2b1268184bbc3aaddd13d7f65a, and contains two executables, dingo-hunter and Gong, and the examples in the paper with the scripts to run them. Next, download the latest version of the Go tool chain in the go1.7 branch. As of writing the current version is go1.7.1. It is strongly recommended to use the binary package provided at golang.org and install to /usr/local rather than distro-packaged version. Follow the installation instructions of the Go toolchain. Check that the $GOPATH environment variable is configured correctly, run the following and check that the GOPATH is recognised and set to a directory (e.g. $HOME/work). 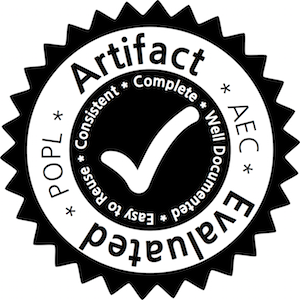 Finally, follow the instructions in the Running section to test the artifacts. The instructions below will install the software and package dependencies for building from source. ghc 7.10.1+, with following packages via cabal. The instructions have been tested on a 64-bit Ubuntu Linux (amd64). Download the latest version of the Go tool chain in the go1.7 branch. As of writing the current version is go1.7.1. It is strongly recommended to use the binary package provided at golang.org and install to /usr/local rather than distro-packaged version. Install the Haskell Platform from your OS (e.g. via apt-get on Debian/Ubuntu Linux, or download directly from haskell.org). As of writing the current version of ghc in Ubuntu 16.04 is 7.10.3 which is the version we have tested these installation instructions on. GoInfer The GoInfer tool (dingo-hunter) is already installed from the go get command above. Gong The Gong tool source code can be downloaded from GitHub as a zip archive. Build the tool by running ghc on Gong.hs, which compiles the as a binary named Gong. Then add the directory containing the Gong binary to your PATH. This is needed for our verify script to find the tool. Finally, download and unzip examples.zip. The md5sum the zip archive is 8c23e1f8881c015298fdebc1fcae3a70, and contains examples in the paper with scripts to run them. Make sure that both the dingo-hunter and Gong tool are installed and available in the path. Follow the instructions below to run the artifact. To run the tool, we provide a wrapper shell script verify to run all the components for all the examples listed in our examples. In the popl17-examples/ directory, use the verifyall script to run all of the examples at once. The script executes two statically compiled binary for 64-bit Ubuntu Linux (amd64). First it runs the dingo-hunter tool (referred to as the GoInfer tool in the paper) to extract MiGo types from given source code. The inferred MiGo types are then passed to the Gong tool to check for liveness and safety. For clarity we use the .migo extension below for inferred MiGo types file, but the content is plain text. The --no-logging parameter suppresses the inference logging output, see also logging. The results obtained from running the tools should correspond with the results in the paper (see table). You can write your own tests for the tools, dingo-hunter accepts as input source code with a main() function. Below is an example of a simple send/receive between two goroutines. You can use the online webservice Go Playground to execute Go code, or to check that the code has valid syntax. For example, here. Save the above content as main.go and run the following to convert it into MiGo types format. MiGo types inferred from the paper examples can be found in popl17-examples/out/, and you can find additional MiGo type examples in this zip archive. This section is intended for developers who encounter problems when inferring from a new piece of source code but our tools could not give a satisfactory output. View SSA To view the SSA form of the source code analysed, this command outputs the SSA input used as input for the analyses. This is similar to ssadump but is configured to use the same options and configurations as the inference. 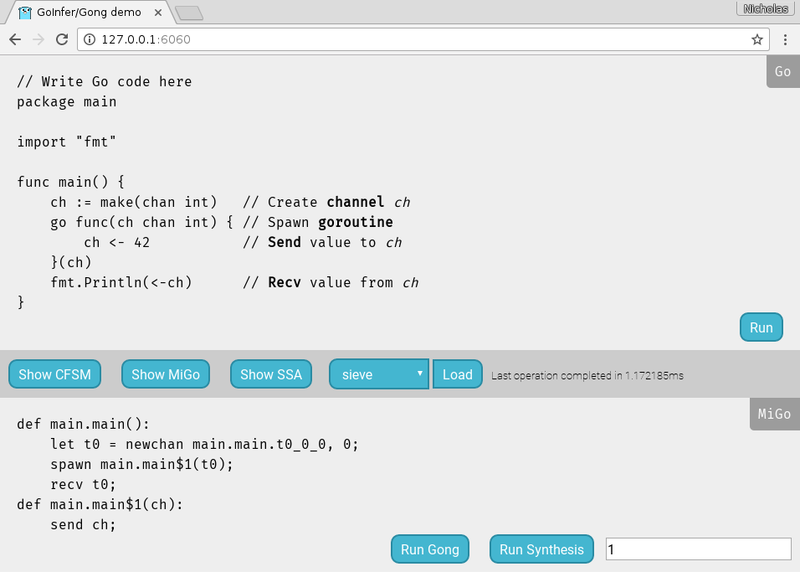 From the generated SSA user can see the instructions and registers for each function and see the correspondence between the SSA and the inferred MiGo types. View reachable states To view full debug details of a given MiGo type, use the -D argument of Gong. It shows reachable states of the MiGo type, and also gives details on the liveness errors (if any). We thank Juliana Franco and Takuma Ishikawa for their comments and testing.